Neil and Shari Medley met in Alaska 30 years ago in a small fishing town in Prince William Sound. 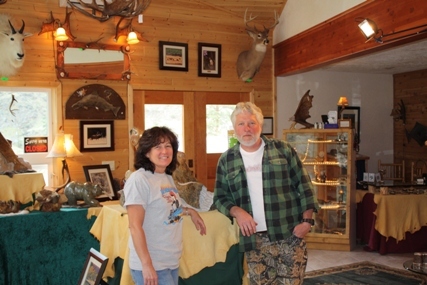 Since that time they have spent countless hours in the wild observing wildlife, hunting shed antler and creating art from the natural antler resource nature provides. Shari was taught the art of antler carving by her father, a master carver in Anchorage Alaska and has been carving antler for 20 years. This type of carving is done with a variety of tools similar to dental tools and drills. For 15 years Neil has created lighting and furniture from moose, deer, elk and caribou antler. All of Neil's lighting designs are U.L. approved. Artwork by Neil and Shari Medley is available from fine art galleries across the United States.